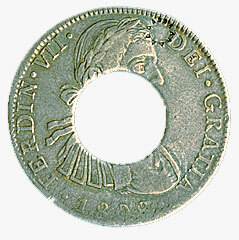 The British colonial period did not mean an end to the shortage of coinage. The economy was still extremely dependent on the fur trade, and any coins arriving from England immediately found their way back. However, the advent of freer trade between the British colonies and the colonies that came to form the United States of America in the late 18th century provided Canada with an influx of Spanish-American dollars. 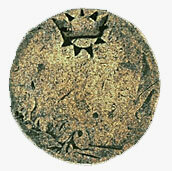 In Prince Edward Island the colonial authorities punched out the centres of these dollars to make two coins, the rims worth 5 shillings and the centres, 1 shilling.